Whether your home is newly built or a century old, it is susceptible to water leaking into the basement. Water damage is a problem that more and more homeowners in South Dakota have to deal with regularly. A leaky basement can cause many problems for your home, such as mold growth, property damage, rotting wood, and worsening foundation problems. 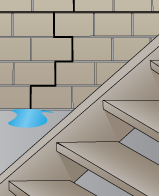 A leaky basement can be caused by a number of problems, such as a settling foundation. When a home’s foundation settles, gaps and cracks can form, easily allowing water to slip through and settle on your basement floor. If you’ve got water dripping down your basement walls every time it rains, you may have a foundation problem. Luckily, Rapid Foundation Repair is available with leaky basement waterproofing in South Dakota and the surrounding area. Our extensive waterproofing and encapsulation services will repair your leaky basement and keep water damage from occurring again. 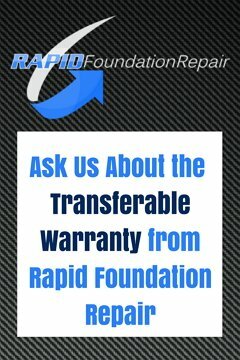 Rapid Foundation Repair offers a number of solutions to the customers in our service area. First, we will determine if there is a foundation problem causing the leaky basement. If so, solutions such as helical piers or wall anchors may be necessary before any waterproofing solutions are implemented. These products can lift your foundation and correct the gaps and cracks caused by a settling foundation. Our waterproofing solutions will leave your home dry for years to come. Primarily, you may be in need of a simple sump pump and sump pit to remove water from your home. 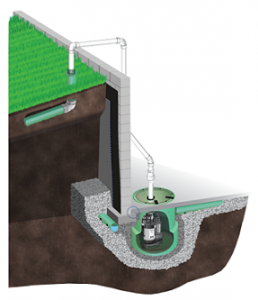 Our Earth Contact Products (ECP) sump pumps can pump up to 5,000 gallons per hour. Our waterproofing experts will be able to determine if you may also need an interior or exterior drainage system. This will allow your home to properly manage the water that is trying to enter your home. If you have experienced water seepage through a leaky basement, it is important to get repairs done immediately. The longer you wait, the higher the risk you are taking for more damage to occur. In order to prevent mold and mildew growth, South Dakota homeowners must eliminate moisture from their homes as soon as possible. Rapid Foundation Repair will inspect your home and help you determine the best course of action. If you would like more information on leaky basement waterproofing in South Dakota, contact us today.